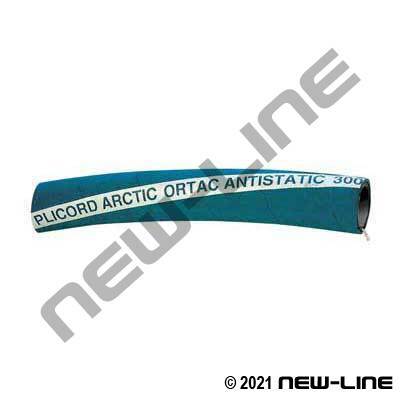 Goodyear Arctic Ortac is the proven, longest lasting Arctic Fuel hose on the market. It is used in similar applications to our NL3260 Goodyear Redwing (however NL3270- is not rated for Biofuel/diesel at this time), and it is designed for use and remains flexible in cold environments to -54°C (-65°F). It is also suitable as a premium multi-purpose hose for air, water, kerosene, certain chemicals, and fuel (if using aviation, for tank-to-tank service only and drain after each use). It is a weather resistant hose that provides excellent durability in sub-zero temperatures. It is also a highly kink resistant (yet flexible) hose ideal for fixed or truck mount reel service applications. NL3270 incorporates a static wire for added grounding capabilities (wire must be exposed and put into contact with the hose end couplings when transferring flammable liquids) but is also available in non-static wire (NL3265). Note: Petroleum delivery hose assemblies should be assembled by qualified technician. Typical Fittings: N95/N96 permanent brass Scovills for fuel service, testing & certification. Construction: Tube: Black, low temp, high quality, synthetic rubber (Chemrin). Cover: Wrapped, blue ultra-low temp synthetic rubber (Wingprene). Reinforcement: Synthetic cords w/ an anti-static wire. Detail Comments: Smaller sizes are available in all black color - refer to our Multiple Service Hose Section.